A wasp is any insect of the order Hymenoptera and suborder Apocrita that is not a bee or an ant. 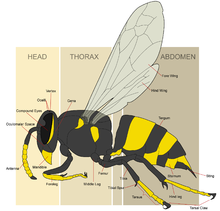 Less familiar, the suborder Symphyta includes the sawflies and wood wasps, which differ from the Apocrita by having a broad connection between the thorax and abdomen. Also, Symphyta larvae are mostly herbivorous and "caterpillarlike", whereas those of Apocrita are largely predatory or "parasitic" (technically known as parasitoids). Most familiar wasps belong to the Aculeata, a division of the Apocrita, whose ovipositors are modified into a venomous stinger. Aculeata also contains ants and bees. In this sense, the insects called "velvet ants" (the family Mutillidae) are actually wasps. A narrower meaning of the term wasp is any member of the Aculeate family Vespidae, which includes the yellowjackets (Vespula, Dolichovespula spp.) and hornets (Vespa spp.). Wasps are mostly predators, rather than plant pests, but some species do cause plant damage, and several are nuisances (or even dangerous) to the gardener because of their venomous stings. Wasps are critically important in natural biocontrol, as almost every pest insect species has a wasp species that is predatory or parasitic upon it, and are often introduced as agricultural pest controls. Two pairs of wings (exceptions: all female Mutillidae, Bradynobaenidae, many male Agaonidae, many female Ichneumonidae, Braconidae, Tiphiidae, Scelionidae, Rhopalosomatidae, Eupelmidae, and various other families). 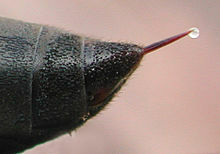 An ovipositor or stinger (only present in females because it derives from the ovipositor). Few or no hairs (in contrast to bees); exceptions: Mutillidae, Bradynobaenidae, Scoliidae. Though less efficient than bees, some wasp species are significant pollinators. Nearly all terrestrial; only a few specialized parasitic groups are aquatic. Predators or parasitoids, mostly on other terrestrial insects; some species of Pompilidae, such as the tarantula hawk, specialize in using spiders as prey, and various parasitic wasps use spiders or other arachnids as hosts. In wasps, as in other Hymenoptera, sexes are significantly genetically different. Females have a diploid (2n) number of chromosomes and come about from fertilized eggs. Males, in contrast, have a haploid (n) number of chromosomes and develop from an unfertilised egg. Wasps can either be solitary or social, with some species (such as hornets and yellowjackets) forming large colonies. Generally, social wasps do not have a mating flight. Instead they reproduce between a single queen and a male drone in the vicinity of their nesting area. After successfully mating, the drone's sperm cells are stored in a tightly packed ball inside the queen. The sperm are kept stored in a dormant state until the following spring. At a certain time of year (usually late autumn) the bulk of the wasp colony dies away, leaving only the young mated queens alive. During this time they leave the nest and find a suitable area to hibernate for the winter. After emerging from hibernation during early spring, the young queens search for a suitable nesting site. Upon finding an area for her future colony, the queen usually constructs a basic paper nest into which she will begin to lay eggs. This varies from species to species in specifics, as not all wasps live in paper nests. The sperm that was stored earlier and kept dormant over winter is now used to fertilize the eggs as they are being laid. The storage of sperm inside the female queen allows her to lay a considerable number of fertilized eggs without the need for repeated mating with a male wasp. For this reason a single female queen is capable of building an entire colony from only herself. The eggs laid initially are sterile female workers who will begin to construct a more elaborate nest around their queen and take over her role of feeding the larvae. Towards the end of the summer, the female wasps begin to run out of stored sperm to fertilize more eggs. These eggs develop into fertile males and fertile female queens. The male drones then fly out of the nest and find a mate thus perpetuating the wasp reproductive cycle. The queens will then leave the colony to hibernate for the winter once the other wasps begin to die off. After successfully mating with a young queen, the male drones die off. Generally young queens and drones from the same nest do not mate with each other. Unlike most species of honey bee queens, the wasp queens only live for one year although exceptions are possible. Contrary to popular belief, the queen wasp does not organize the wasp colony or have any raised status amongst the social group. She is rather the reproductive element of the colony as all members of the colony are theoretically direct genetic descendants of the queen. The nests of social wasps are first constructed by the queen, and then expanded as more workers are propagated. Unlike honey bees, wasps have no wax producing glands. They manufacture a paper-like material from wood pulp. Wood fibers are gathered from weathered wood, softened by chewing and mixing with saliva. The paper is then used to make combs with cells for brood rearing. 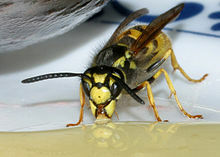 Solitary wasps are mostly parasitic on other insects. With most species, adult parasitic wasps themselves do not take any nutrients from their prey, and, much like bees, butterflies, and moths, typically derive all of their nutrition from nectar. Parasitic wasps (more properly called parasitoids) are extremely diverse in habits, many laying their eggs in inert stages of their host (egg or pupa), or sometimes paralyzing their prey by injecting it with venom through their ovipositor. They typically inject the host with eggs or deposit them upon the host externally; when the eggs hatch, the larvae eat the prey alive, saving the vital organs for last. Vespidae - yellowjackets, hornets, paper wasps. This page was last edited on 15 December 2011, at 01:16.